Home » Career and Job Search Blog » Can you joke in a job interview? Job interviews can be tense, nervous and sometimes frightening affairs. You may be tempted to lighten the atmosphere by telling some well-meaning jokes. Humour can cut through the monotony of the standard answers the interviewers may have heard all day. But it can backfire. Not everyone will share your sense of humour. So can you joke in a job interview? It’s important to bring a positive attitude with you to a job interview. But a joke told by a stranger can come across differently from when it’s told by someone you know. Not everyone will find your sense of humour amusing, and a misplaced joke could cost you the job. So when is it okay to exhibit your sense of humour and when should you keep quiet? Exhibiting a good sense of humour can be a great way to show your positive nature, especially if this is a reflection of the ‘real’ you. The right funny remark, delivered at the right time, can help establish rapport with the interviewer and, if they’re your potential future line manager, can show if you’re going to enjoy working with them. It also allows then to gauge whether you’d fit in with their organisational culture, which is key to a successful job interview. Obviously, when it’s a more formal interview you shouldn’t clown around. Take your cue from the interviewer and what you’ve learned about the organisation through your pre-interview research. For some people being entertaining can come across as unprofessional, which you definitely want to avoid. Be aware of how people might interpret your humour. Not everyone will share or get it. Jokes in job interviews can come across as sarcastic put-downs aimed at the interviewer, even if you mean the humour to be directed at yourself. If you’d like more help with answering potential questions, interview coaching can help you prepare for every scenario. 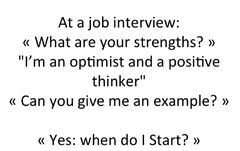 It’s always a good idea to bring a positive attitude with you to the job interview. Remember to smile and, if you feel comfortable doing it and the circumstances are right, share one of your (pre-prepared and well-practised) funny anecdotes or witty remarks. A sense of humour is a soft skill that many employers are looking for. So tell that joke if you think everyone will laugh!